It's been a while since I've swapped out any of the wreaths that hang in our house. Yes, I said wreath(s), as in plural. As in there are three. You may recognize this burlap wreath from a tutorial I posted shortly before Valentine's day. The other two burlap wreaths that hang in our house are more of the neutral tone "bubble" variety and hang both in our foyer and dining room. And they've been hanging there since the middle of winter. With the blooming cherry blossoms and pink and yellow tulips that have taken over our front yard, I knew it was time to change things up and do a little Spring Cleaning of the stark, colorless winter decor that hung on our walls. As I scoured the Internets and Pinterest for some colorful ideas, nothing really struck my fancy. Of course, I could have busted out a pastel colored rag ribbon wreath, much like the Fall one I posted here but deep down, I was jonesing for something I wouldn't grow tired of quickly. Something a bit more neutral. And I'm suddenly realizing I have a serious wreath problem. On a recent trip to Hobby Lobby I once again found myself in the floral department, lingering in the aisle where all of the styrofoam floral wreaths hang. Immediately next to the wreaths were giant bags of Premium Grade Spanish Moss. And that's when it hit me. A little hot glue, a foam floral wreath form, some ribbon and voila! 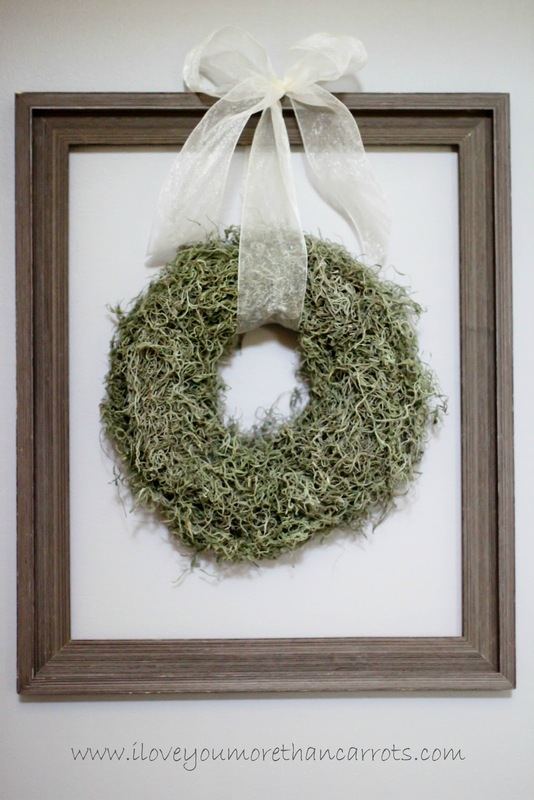 A Springy little wreath to replace the stark white burlap wreath that hangs in the open frame in our foyer. But what about our blank canvas of a front door? And then I suddenly recalled my love of monograms and letters. I posted here about a berry covered letter hang and knew that I'd like to try and recreate the same effect- but this time with the Spanish moss. I mean, how difficult could it be, right? Difficult it was not. Messy? Indeed. Oh, the mess. Just be prepared. 1. Start with wreath form laying flat on a hard, flat surface. Begin grabbing handfuls of moss and breaking them into large handfuls by either tearing the moss or cutting with scissors. (I tore the moss which was the more difficult of the two options, but patience was never my strong suit). 2. 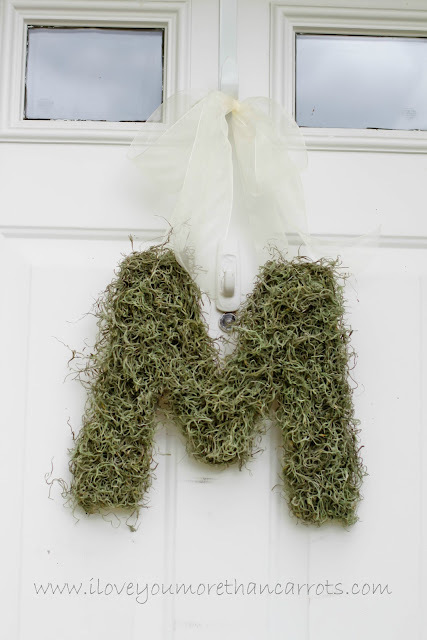 Roll the handfuls of moss between your hands to "elongate" the moss into a mold-able strip that you'll be able to apply to the inner circle of the wreath. 3. With no rhyme or reason, apply hot glue to the inner circle of your wreath. Press your elongated moss handfuls onto the hot glue, holding for a few seconds to make sure the glue has set. It will probably take you three to four handfuls of moss to cover the inner circle. 4. Follow suit along the top of your wreath, the side facing up towards you when laying on a flat surface. I hot glued my glue lines all willy-nilly before pressing my moss down. Don't forget, you'll be able to go back at the end of the project and fill in any gaps or holes you may notice. 5. Once the top of your wreath is covered, begin applying hot glue, followed by moss to the outer ring of the wreath- This is done so as to hide the sides of the wreath that you'll be able to see once it is hung on the wall. 6. Once complete, stand back and admire your handiwork, filling in any small gaps you may notice with hot glue and moss. Now you're ready to hang! Simply cut your ribbon to the desired length, loop through the inner circle of your wreath tie a knot and voila! 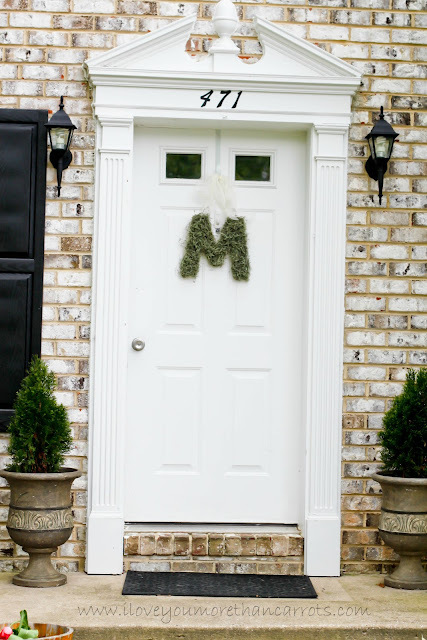 You'll notice my wreath hangs in an open frame in the entryway foyer of our home. Add an additional bow embellishment if desired! 1 Wood Letter (I found mine, unfinished, at Joann Fabrics. It's the same wood letter used in the DIY Berry Letter Monogram tutorial noted in the beginning of my post). 1. Start by tearing your moss into chunks and rolling it between your hands to "elongate" it. Occasionally, if it's a bit "wild" you can use a single strand or two to wind around your handful to "tame" it a bit. 2. Begin willy-nilly applying hot glue to your letter in three to four inch sections. Press your moss down onto the glue and hold firmly to let it set. 3. Continue the hot glue-then-press-down-moss pattern until you've covered your entire letter. Be sure to check for gaps along the top and sides of your letter and fill in as needed. 4. Cut your ribbon to the desired length and hot glue the ends to the back of your letter for hanging. Ta-daaaaa! Be sure to add a bow for extra embellishment! to your decor this season! I am obsessed with this. Should it be my first crafting project EVER? Love your ideas. Have a wonderful weekend! I need decor for my door and I MIGHT be crafty enough to accomplish this. Thanks for the tutorial, this just may have to be the project I have been looking for. I need something I can be okay with not finishing in one sitting (you, with the baby and such ;) ) so this could be just the ticket! And my front door is nakey right now! These look great AP! I may just have to attempt the letter one! Those are so darn cute, I really want to try one but I'm afraid M make punch my face in if I do another DIY, and a messy one at that! Love the way yours turned out. I've seen this on pinterest before and always wondering if it was easy or not! I want to try it now...But where do you buy the spanish moss? Home Depot or Craft store? AP I love love love your new wreath- it looks sooo good! I am a bit obsessed with making wreaths these days! I just made an Easter egg wreath, but I suppose I should make a new one, now that the holiday is over! 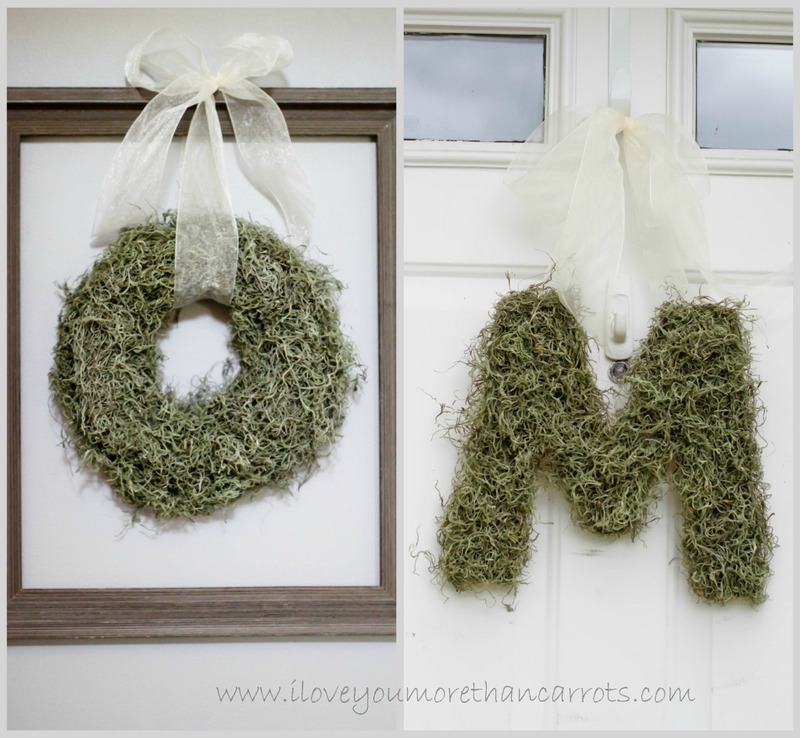 I do like the mossy wreaths, but our front door is dark green, so it might not work too well! This is so gorgeous!! Very Springy :) I'd love to give it a go!